Spring Cleaning Tips for your Car! Spring time! Tis the season to tidy up, and that includes your car. Your trusty four-wheels have rolled through dirt and grime all year, baked on by the head and muddied up again by the rain. If you ask us, it’s about time for cars to get a well-earned bath! Here are a few ways to tidy up your car this spring. Rarely do drivers look at, much less clean the underbelly of our cars. Early Spring is the best time to blast it with a pressure washer to prevent rust from accumulating and wash the entire undercarriage. You can also get this done at a professional car wash, but we think it’s much more for fun to pressure wash! This is one of the easiest, most noticeable things you can do to clean your car. It’ll improve visibility and can give your car a bit more sparkle than just a run of the mill car wash can. This is something is best done once or twice a year anyway, so why not make it a part of spring cleaning? You can purchase wax yourself or go to a car wash and select an option with a wax coating option if you prefer to have it done for you. Either way, the wax will seal in the paint and add a shine, and who doesn’t like shiny?! Little twigs and leaves seem to have a penchant for collecting where the hood hinges onto your car and surrounding areas under the hood. It’s a good idea to clean these all out. And while you're there, might as well check the oil and refill your wiper fluid too! This is one of the biggest cleaning jobs that you’re car will need. Taking out the floor mats, hosing off or vacuuming those, washing off the underside of the mats, vacuuming the car floor and all the seats… there’s a lot to cover. You can get it done professionally as well. However, we recommend getting a friend to help, and feeding that friend pizza for helping out. What a good friend! This can be a task and a half especially for those of us who travel or collect clutter. It’s high time to wash the spare blankets and towels in the trunk, as well as clean out any of the trash or forgotten purchases cumulating in your car’s storage space. Maybe you’ll even find a long lost treasure or two in the process! If you’ve been driving about on winter tires, then you’ll need to switch to summer ones soon in order to keep your traction and gas mileage at it’s best. Alternatively, if you have all-season tires, take a moment to check that your tire pressure is up to par and cross this one off your list! One of the most important things for drivers is visibility, which is why having bright lights is a must for your spring cleaning to-do list. Luckily, it’s also a very easy fix. Take some warm, soapy water to all the lights and scrub for a bit. You’ll be able to see better and be more easily seen yourself. Well, that’s our to-do list for spring cleaning. 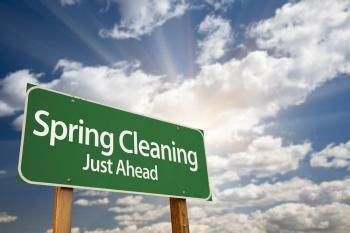 What kinds of things are part of your regular spring cleaning routine? We’d love to chat about it, after all, cars are our favorite subject! If you’d like to know more or have any questions about auto repair and maintenance, come in to Gary’s Auto Service or give us a call. We look forward to meeting you soon!